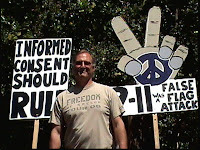 The concept of "Civil Informationing" came to my mind when I was involved in planning and executing several typical anti-war protests against the upcoming and ensuing war in Iraq while living in Reno, NV in 2002, 2003 and 2004. What stood out to me THIS time around is that NOW we had the Internet...we were only doing the exact same "dated" things that were developed 40 years earlier (again!) And there was not very much integration between the "Internet and Information age", the people protesting in the streets, and the citizens observing our actions. What was frustrating was that although the VAST MAJORITY of feedback was against the war [interesting AYE? ], citizens walked and drove past without becoming more informed about what was going on. It was clear to me that activists' "public protest tactics" needed a change...a complete overhaul...because the "age old" models of protest activities were clearly not working in spite of the fact that we had some new tools at our disposal. In the years since, more and more excellent videos, DVDs, You Tubes, handouts and other "teaching tools" have been developed...mostly at the hand of many wonderful 9/11 Truth activists. YET, the confrontational "challenge authority street actions" have remained exactly the same as they were some 40 years ago. Civil Informationing (CI) was developed to bring the best of the 60s forward, [such as the great power and wonderful hearts of concerned citizenry and the willingness of those folks to stand up in public to voice their opposition], and to integrate it all with the new millennium's "information age" educational potentials found everywhere within the Internet and videos. Neither myself, nor Civil Informationing, nor any of the gang in the 9/11 Civil Info Blogspot take any credit for the process of being "polite" to others. Being polite and respectful are well developed and successful behaviors that have worked well for centuries. However, we will take credit for reminding activists that maybe, right now, at this stage of the game, being polite is the best way to behave in public when trying to influence and educate our neighbors in positive ways to join us in making a change. ...understands that for a democracy to work, citizens need to be properly informed with the truth, and that existing public education and corporate media are deliberately dumbing down and misinforming students and the public respectively. Bad commercial TV speaks eloquently for itself as a contributor to the decline of worldly awareness. At this stage of the game, most folks will actually trust their neighbors over their governments, [unless they dress like a "Cat in the Hat on Stilts...(Taibi)", as images of the 60s and 70s remind us]. Consequently, the value of having good information to hand out, being friendly, and having a smile and a handy "How Ya doin? "...goes a far longer distance in public relations than does marching, chanting, confronting and raging through the streets. Most folks do not trust the government, and the 9/11 Truth Movement simply hands out information and asks that each person "decide for themselves". This is a very good and respectful way to go...and it is something very different from what is commonly available from corporate media, corporate advertising, dishonest politicians and their paid consultants. ...were designed to attract the corporate media's attention to whatever cause was at hand. This very process rewarded the more extreme behaviors in groups and in individuals so that "the issues" would be placed on the front page thus informing the public. Truth be told, such extreme behaviors ended up alienating "John and Jane Doe" because most folks simply do not want to be "disobedient", nor do they want to be "confrontational"...but they really do want to be good citizens. And now, most want to make a change. So, it is of no surprise that the numbers of participants in such major marches eventually diminished greatly. I argue that they were driven away by the bad behaviors and CD expectations of the remaining more radical activists. Its my belief that this element of the 60s protests, the dependence upon the corporate media to spread the word, remains the single weakest link in the entire battery of last century's activisms. Depending upon the corporate media to get one's message out proved to be very easily controlled by the corporate media itself because they simply were able to chose to NOT cover it, or, they would under-report the events, or, more importantly, they would spin the entire story away from the facts, truths and original objectives. They would simply create their own self serving story [insert Operation Mockingbird here...]. And of course, when the corporate media acted this way, it both angered and discouraged activists simultaneously. Game-Set-Match goes to the corporate media...and going home broke, frustrated and unsuccessful goes to the "huge march"goers... our beloved activists. Anyway, moving ahead into THIS millennium, being out in public performing CI on routine schedules in busy places while handing out our VIRAL information is surely a slower process than it would be IF the corporate media were to blast our 9/11 Truth story, but, CI is flat out unstoppable...a classic rabbit-tortoise race! Also, CI supports all the elements of alternative media that are springing up everywhere nowadays. Our new information age is certainly "fertile", and I encourage folks who are creating such alternative media venues to join us out there in their local neighborhoods and hand out some of your own stuff! BEING MORE LOCAL vs. "March of the Penguins"
If one does look into the stunning documentary "Sir! No Sir", and can view it objectively, one might see that the HI PERPS [Nixon and the Military Industrial Complex etc.] had to change the real story about why Vietnam ended. They lost the ability to execute their ground war because they lost control of the ground troops as the GIs eventually figured it all out and began killing their own commanders instead of killing the Vietnamese. After some thought it becomes clear that the HI PERPS actually WANTED protesters to travel to distant places, to spend all sorts of their assets, to assemble in great numbers, to march in front of nobody but themselves in WDC, and critically, to come to think that this process actually was the MAJOR factor in ending the war. And the icing on the cake, the protesters would go back home thinking that their "Mission was Accomplished" when actually, it wasn't..
One of the reasons that the HI PERPS did this was because eventually, they knew that they would gain control the media coverage. Consider the Grenada-Panama-Gulf War I sequence of increased control of the media and you can see that after Vietnam, the military HAD to do something about the free press. Please understand that I FULLY understand that the GIs would NOT have been as confident to take their own life saving actions without all the Peace marches etc...so, what we did was certainly important. However, in the end, all the "marches" were able to be made "invisible"...much like "The March of the Penguins" would be invisible, and thusly, under-reported, IF there were no cameras set up in Antarctica to see the critical event. No cameras...no March of the Penguins. No news reporting...no March of the Activists. It remains this way today. In conclusion, since if the truth about the soldiers solving their own problems in Vietnam would have undermined the authority structures within the military for decades to come, as well as to give clear instruction for future generations of soldiers on what to do if they were involved in an unjust war, maybe the 60s activists have been "psy-oped" as to their successes similar to the way that the world was 'psy-oped" with the events of 9/11/2001 ...the truth being one thing, and the imagery and popularized folklore being another. Maybe Nixon was just playing his role when the famous story about him seeing the hundreds of thousands of protesters outside his window and being "afraid of them" was circulated. Maybe he was not telling the truth to the American public? CI calls for... more local... more frequent... more "inexpensive"... always legal... always cooperative... always polite...always respectful... and more "public" displays of activism that take place not at a distance from citizens [like peace vigils], but instead, amongst and interactive with people right in the middle of the busiest "people and vehicle" places one can find. The consistent and more frequent schedule allows our fellow citizens in our own towns get to "see" that something is really happening in their towns, that someone is motivated enough to speak out against our government, that the gathering is polite, respectful and welcoming, and that the schedule allows for their occasional involvement, if so desired. In adopting this approach by the CI activists, the average citizen comes to see that a few of their fellow citizens feel quite strongly about something, and that they are giving out "information" that asks that we all seek the truth, to become more active in our democracies, and that the public event is non-threatening. This is all good stuff. The process of Civil Informationing brings a citizen's responsibility for involvement in sustaining their own governments back to themselves. Both the "representative style" of our democracies? AND the protest activities of the 60s transfer responsibility to someone else to enact what "the people want". Clearly this has not worked as our elected representatives have been bought out, or, are representing the upper classes of citizens,or both. The environmental movement and the anti-nuke movements have remained successful because they have kept informing people about such issues for the last 40 years...not so with the peace movements. And when the anti-war "cats" went away from WDC, the "rats" came to play...and now, WDC is crawling with rats...rats that we have elected again and again. The Internet brings the both the "world" and our fellow citizens right to our fingertips as we can gather whatever we want from the net on our own schedules. And, we can now "meet up and gather" with whomever we want to meet up with...but virtually.However... performing CI in local communities puts a "human face" on the electronic wizardry and tentacles of the Internet. This is why there are so many "Thank yous" offered by citizens to me and other CI activists when we take to the streets in the MODERN way. The citizens do care, and we show that we also care... and that we are unafraid to be out in public. In an odd way, the peace marches of the 60s was another example of transferring our individual power to the hierarchy of those atop the peace groups whom we entrusted the same responsibility to make changes just as we expected our elected officials to make changes. We marched and went home thinking something was going to happen with our opinions and we voted and went home thinking that something was going to happen with our opinions. We have allowed our own personal power and responsibilities to be "centralized" in far away places and sorta lost track. With the Internet and its power to allow us to "meet-up" virtually, we can take back our own process of educating and organizing ourselves. We can, and are DECENTRALIZING the powers within WDC and RECENTRALIZING them right on out laptops at the end of the web world's tentacles. Practicing CI personalizes the Internet and brings human beings out meeting human beings in neighborly ways that brings the beginning of meaningful changes right to our towns and cities. As citizens become more and more involved with the "virtual meet-ups" of their interest, there will be a HUGE difference between the 60s protests and the new millennium's modern public activisms. The 60s protests mostly changed opinions but failed to remain or become a political force for major change, the modern activisms are becoming a very powerful political force because citizens are becoming informed, and slowly, we are regaining control of our abilities to give or withhold our consents. This is a good thing and it will not go away. Just ask the 14-30 year olds. The single major difference between 60s marches and gatherings, other than the size and locations, and CI, is that the entire concept of CI...being CIVIL and being INFORMATIONAL calls for NOT confronting or loudly arguing with those with whom one disagrees. Persons conducting CI simply terminate any engagement with those who would disrupt the event or loudly disagree. CIers express that its great that we live in countries that allow a difference of opinions and that they hope this person has a nice day. “Co-mingling” the PEACE SYMBOLS or the words of PEACE at the event allow for no words to be said if need be, and only the two fingers flashing a "peace hand sign" to be held up as your answer. Some folks with strong opposite positions will surely make some type of "scene", and they can be asked to leave you alone because they came to see you and not vice-versa. Actually, we want the opposite of confrontations or loud arguments to be the order of the day. If other citizens see your 9/11-PEACE Civil Informationing presentation and note that friendly conversations are happening, and see that there is willing sharing of information with the citizenry where a CIer is standing, then a POSITIVE image is being presented which makes for more POSITIVE vibes and meetings with citizens. The well established interactive "habits and attitudes" from the 60s calls for the exact OPPOSITE activity to take place when one deals with a person or persons. In fact, CD and protesters from the 60s and 70s, and their heirs since, usually were quick to respond to people holding opposite opinions by confronting, if not pouncing on them creating the confrontational "scenes" that make it to the news cycles. In the end, there is a "turn the other cheek" thing going on here...and it is well worth it to do so. Eventually, your peace fingers, smiles and refusal to respond to the "provocateur's" verbal assaults will cause those persons to go away. AND, your esteem in the eyes of an average citizen will greatly rise. In this way one can take a difficult situation and turn it completely around to our favor. Experience will grow in accomplishing this. Friendly Fire: Friendly looking and acting people who are in on the organizing and planning of events who quietly influence the plans to "walk the line" between legal and illegal behaviors, or between nonviolent and violent behaviors, or the most difficult one to notice, between "achievable goals" and foolish or “unreachable goals” that are designed to fail. Unfriendly Fire: These folks are the "sleepers" in public group activities who secretively keep suggesting that "the gang" do more and more aggressive things...its the crowd mentality thing...and in the end, nobody really knows who it was that suggested that the actions get "ramped up". By contrast, Civil Informationing is a concept whose goals are to NOT be disruptive, law breaking, confrontational, or aggressive in public. Its designed as the opposite. Game, set match goes to CI because the planning is already done, because the goals of the event are already established, and the behaviors of all the Civil Informationers is firmly established. Cointelpro and agent provocateurs are exposed immediately because they stand out so clearly. There is no cover for these creeps in the CI actions. "All I am sayyyyying .....is give CI a chaaaance"
It would be interesting to see some video of what you think are ideal examples of the types of Civil Informationing you are talking about. Orangutan. on Fri, 05/09/2008 - 11:42am. Videos can be a problem for C.I.ers for several reasons. Secondly, if you are working alone (as Robin usually is), who will do the videography? Thirdly, as a CI activist, there is also a question of ethics: Do i want to act like Big Brother and record people who are just wanting some information and then post it on the internet for others to see for their amusement? The people we are talking to may not appreciate that and scare people off. I am very cautious with still photos too, and try to only capture our members and not the people we are talking to in any identifiable way. This is totally the opposite of confrontational activism. We don't want to give anyone any reason to fear us. ... it's the other War on Terrrorism ... silly! adanac on Wed, 05/21/2008 - 7:22am. Just pick any video that involves 9/11 truthers who ARE NOT acting in confrontational ways, but ARE acting in informational ways and being polite with the public. We have thousands of them...but they never make the news so most go unnoticed. Ballparks, shopping centers, airports, concerts, high schools and churches are the next great places in line at which we can perform CI. Just be there, just be visible, just be polite, just give stuff away if they want it. We are not going to go away-ever, and we speak and seek the truth. Citizens will remember us standing up for our democracy. "We agree with everything that you are saying, but do you have to do this here? Yup, we do...and she took a flyer. Robin Hordon on Sat, 05/10/2008 - 12:05am.